Puppies will be bred in a garden access apartment and will be in touch with human love, forbearance and community from early beginning. They will be contacted with the noise of the street and the rush of the household, as well as they will come into contact with other visitors among which the children will not be missing ☺. Visits will be possible only from 3 weeks of their life when they begin to perceive and discover the world around them. The puppies will be properly vaccinated and dewormed, with regular veterinary supervision, marked with a chip and a tattoo. They will go to its new homes once they will reach 8 weeks. When taking puppies as the new owners, you will receive a Proof of Origin (PP), PetPassport - a vaccination card and a startup package. Together with your puppy, you will also receive a purchase contract. Of course, there is guaranteed a whole life breeding support. 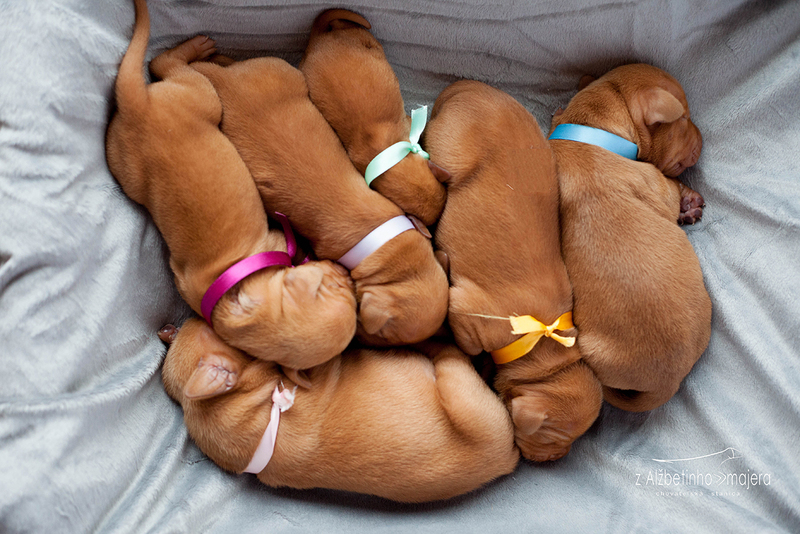 We consider necessary to contact you as the new owners of puppies and providing us with information about the puppies. It is a priority for us to secure that puppies will become family members in new homes and they will live a happy and satisfy life. Thus, we are interested in your plans and ideas you have with your puppy in advance. The puppy is not a toy but a live creature. It will bring you a joy but sometimes also the troubles. It will not always be easy and everything will not go according to your plans. So we expect serious approach from you at all times.